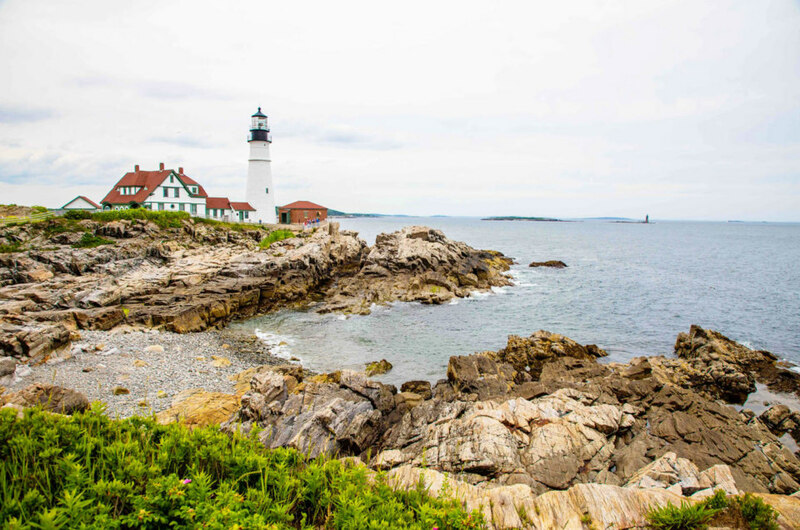 New England in the summertime means lighthouse visits, blueberries in every possible dessert and coastal hikes galore — at least, that’s what Keryn Means of Walking on Travels tells us. 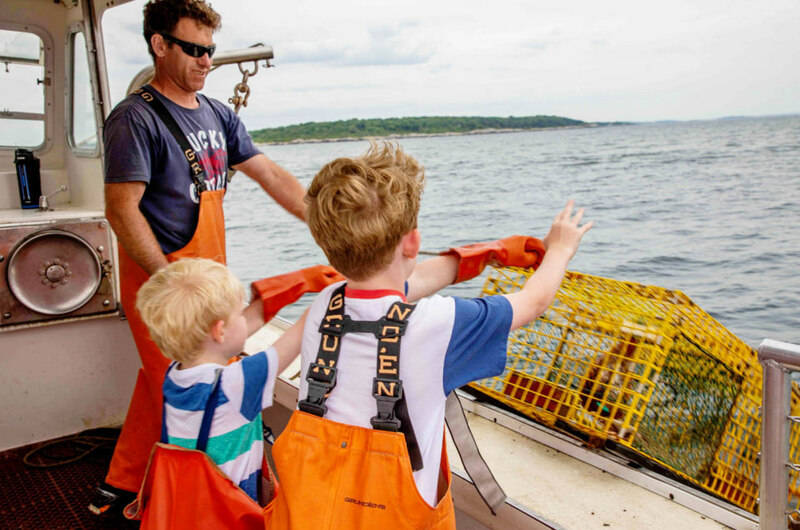 We sent Keryn and her two boys to Portland, Maine this summer to discover the best adventures the area could provide. Little did they know, this state had a few surprises in store. Read on to learn more about their adventures in the mountains, on the coast, and even in the desert. Hey Keryn! Thanks so much for joining us today. We’ve known you for a long time, but can you take us down memory lane to tell us a little bit about yourself and how you got into travel blogging and photography? Since a young age, I’d always been curious about other cultures and places, which I fed through a healthy diet of National Geographic magazines and PBS shows. My family didn’t have a lot of money, but that didn’t mean we stayed put. My mom got us out exploring around my hometown of Philadelphia, taking daytrips and reliving the city’s history. Every summer we trekked up to New England to sit on a lake where my great uncle had a cabin he let us use. I never went abroad until I was 16. My aunt took me to visit missionary friends in Mexico. It opened my eyes to a whole new world and way of living. I was hooked. In college, I studied photography, capturing the faces of my classmates, family and people around town in their natural environments. Later I got my master’s in journalism. With both degrees, I could tell stories in a multitude of ways. Once I had my two boys, travel blogging allowed me to share with other parents the joys of traveling with kids, but also the painful moments. I’ve found that moms in particular need to know that it is OK when things go wrong, so that they are not alone when their vacation isn’t as perfect as that glossy photo in the magazine. I love to share my life with other parents, remind them to take their kids with them, but also leave them at home so they get a break with their partner, or time with girlfriends out on the road. When we are refreshed, we are better moms (and dads). How would you describe your travel style? Did it change a lot once your kids started joining you? I’d have to say I’m a “semi-planner” when it comes to travel. Before the boys were born, I was hyper-focused. We had to see and do it all. Once we had kids that all had to get tossed. My life is so much more relaxed with kids in it. I know, it’s crazy! By relaxed, I mean I had to give up that tight hold on the controls, and let whimsy back into my life. We always have a list of things we want to do, but instead of hitting ten things in one day, we hit one. If we are able to visit more than that I’m thrilled, but we allow time to get lost, find something that isn’t in the guidebook or on any top ten lists. I’ve had more amazing adventures with my kids because we didn’t have a plan than I ever did before I traveled with kids. This philosophy persists in all of my trips, even without my boys. Serendipity is a beautiful thing! You and your sons recently explored Maine for a few days. What makes summer in Maine so magical? Coming from the mid-Atlantic region, my first inclination is to say the weather. Any drop in the heat and humidity is a blessing. My mother used to bring us to New England the last two weeks of July, claiming it was the hottest two weeks of the summer in Philadelphia. Mother always knows best. Summers in Maine mean fresh blueberries, lobster right out of the sea, hiking along the coast, and taking a dip in the ocean. Instead of sitting by the pool or at the beach all day, you can actually get out and explore, if you are so inclined. You still have to slap on a bit of sunscreen, but you don’t have to worry about passing out from heat exhaustion when you hit the amusement parks, national and state parks, or mom and pop joints off the interstate. You can also get off-the-beaten track very quickly, and find yourself alone. There aren’t hordes of people taking up every square inch of space, even in the cities. If you are looking to unplug and unwind, Maine is the place to be. There’s no such thing as too much lobster in Maine. Tell us about your experience on the lobster boat cruise. My family were not fish people growing up. Only as an adult did I start to enjoy crab, lobster and other fish from the sea. My boys are different. They love anything that can swim. Getting to go out and see where their food comes from was a rare treat. The Lucky Catch captain and crew made sure that everyone, both kids and adults, got the full experience of being a lobster man of Maine. We pulled up traps, made chum bags, threw back craps, cleaned out cages, and measured lobster. The kids even got to put rubber bands on the lobster’s claws. There would be no pinched fingers on our boat. Plus, I’m not sure that there is anything cuter than a 6-year-old in bright orange coveralls, but sadly, I could not keep them. Just think of all the clothing that I could protect if I had! I may have to head back to Maine to find a shop that sells them. We also heard you three enjoyed plenty of blueberries! How did that come about? What was your favorite treat? Our blueberry extravaganza came about by accident. I had no idea that Maine was known for their blueberries. Quickly, I started to see a theme around town though. While having dinner at the Inn by the Sea in Cape Elizabeth, Maine, our server confirmed my suspicions. Maine Blueberries were a thing, and one to be celebrated. In fact, there are several festivals throughout the summer that pay homage to the blueberry that is ripe for harvest in late July/early August. The boys and I started counting all of the ways we enjoyed blueberries during our trip, and even more products we found that included blueberries (blueberry jam and syrup being our favorites). My personal favorite was the blueberry butter on our dinner rolls at Seaglass Restaurant at Inn By The Sea. I wouldn’t say no to another scoop of Blueberry Sour Cream Crumble from Mount Desert Ice Cream either. The boys? Well, they would have Blueberry soda (made by Maine Root Beverages) at every meal if I allowed it. Oh, how many different ways did we have blueberries? I believe we saw and/or ate at least 14 in just under four days. Not too shabby I’d say. The Northeast is known for its lighthouses. How many did you get to visit during your stay? Portland has six lighthouses in the surrounding area. We were able to visit three in the four days we had in Portland and Freeport. We were trying to get to more, but sadly, a little rain derailed our plan. My favorite was the Portland Head Lighthouse. The cliff walk trail is easy (and safe) to do with kids. It is also the perfect spot to capture a few photo moments with the entire family. The wild roses were in bloom and we found a path that brought us down to a rocky beach so the boys could climb around before dinner. There are three food trucks near the lighthouse if you need a snack. It is also connected to Fort Williams park, which has plenty of picnic areas, a fort to explore, children’s garden and a playground. We also got to Two Lights State Park. Many people don’t realize that the lighthouses actually aren’t in the state park. I saw the state park employees turning more than one car around. The park is definitely worth visiting, but if you want the light houses, you have to go down the road to the left a bit more. You can grab a lobster roll at the Lobster Shack and gaze out at the two lighthouses within view from the rocky coast. Back at the state park, you can enjoy the playground and picnic area, but it is the rocky coast that most people come to enjoy. Hike the cliff trail for the best views, or let the kids climb around the rocks. During low tide, pools form inside the larger rocks where you can dip your toes and look for sea life. What are some things that surprised you and your boys about Maine? 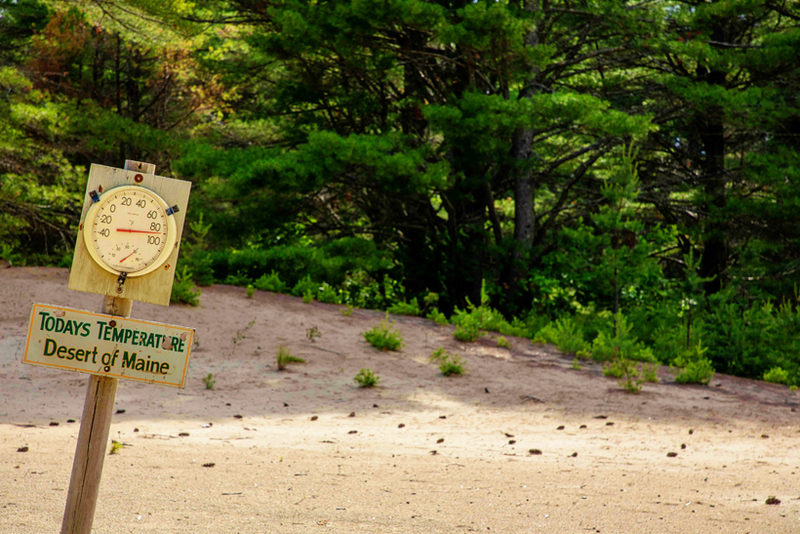 Two things really surprised us about Maine, and both had to do with sand. The first was that there are sandy beaches in Maine. The other was that Maine has an actual desert. We discovered the sandy beaches when we walked out to see the water on our last day at Inn By The Sea. I am used to the rocky New England coast and grassy lakes. After crossing the dunes, the landscape opened onto a wide beach just waiting to be splashed in much to the delight (and squeals) of my boys. Apparently, southern Maine is covered with sandy beaches, something many locals don’t always share with their neighbors to the south. The farther north you go, the rockier the beaches become, not that you can’t find a rock-filled beach down south. The other shock was that there is a desert in Maine. Thanks to a few massive farming mistakes 200 years ago, the Desert of Maine appeared, and a major geographical phenomenon is now hiding just outside of Freeport, Maine. It is on private land, but you can pay an admission fee that includes a 30-minute ride through the desert, a history lesson about why the desert is there, and access to the nature trails and gem field. My boys weren’t so sure about this “educational” excursion at first, but our guide was a teacher during the year, and quickly grabbed their attention and never let it go. The promise of hunting for diamonds for mama in that gem field helped a little too. As a photographer, what would you consider the five most Instagram-worthy spots in and around Portland? Just five? That’s not fair! Portland Head Lighthouse: walk the cliff trail for views on both side of the light house. There are plenty of props along the way. Fort Williams Park: There are several gardens in the park, as well as the old fort, that offer up some very fun spots to go photo crazy. Two Lights State Park (the actual park, not just the lighthouses): The rocks jutting out into the water are a textural marvel. Be very careful during high tide and never turn your back on the ocean. Those waves come up fast and fierce. I’m sure more than one person has been sweeped out to sea when getting too close for a shot. There are plenty of great spots to capture your perfect moment at a safe distance from the ocean. Exchange Street: There are some great murals and alleys to use as backdrops, as well as funky store fronts. 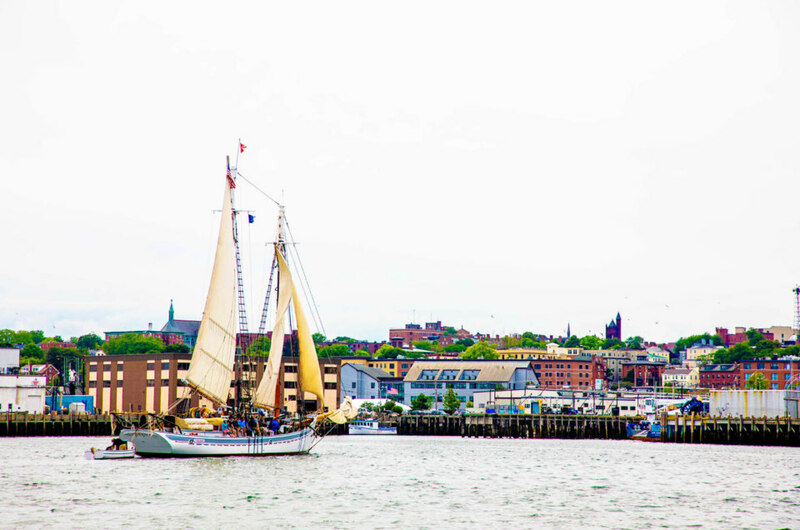 Old Port: The old port is filled with fishing vessels and piers that you can walk down in your adorable stripped sailor top or lobster sweater for the perfect Instagram shot. Rain or shine, there’s plenty to see and do in Maine. What were some of your favorite family-friendly activities? Portland and Freeport (just a 20-minute drive apart) have plenty of activities to keep kids of all ages entertained. No one likes to think about it, but rainy days do happen, so hit the indoor activities first. Portland has a number of great museums for families, including the Portland Museum of Art, Children’s Museum and Theatre of Maine, and International Cryptozoology Museum. Once the rain dries up, head outside to the national and state parks to let your kids run. For a few learning opportunities, head to Maine Wildlife Park and the Desert of Maine right outside of Freeport. The L.L. Bean campus in downtown Freeport has several installations set up outside of its stores, including wooden houses and instruments near home shop. Each summer a free concert series is hosted in the park. Pop inside the main store (near the big boot) across the way to see the trout in the pond and aquarium if those rain clouds roll back through. The aquarium has a little dome your children can stick their head in so that they can feel like they are swimming in the tank with the fish. Anything else you’d like to add about your trip? It has been an embarrassingly long time since I was back in Maine. New England has always been my happy place, but getting back to the coast just reminded me how much I missed this beautiful, wild state. The people are warm and welcoming. There is no pretention here at all. Have a question? Just ask it. Need to know where the nearest bathroom is for your son? Someone, everyone will try to help you out. The people of Maine are proud of where they live and they want to show it off. Ask them why they love it. No two answers will be the same. The cities are slowly changing, just like many other cities across the U.S. (yes beer lovers, there are microbrews here worth driving to, or so my brother-in-law tells me), but one thing will always stay the same. Nature is important and protected, but so are the people. Come here to reconnect with your kids in a way you can’t do many other places. Go on a hike, let your kids lead the way, and maybe find some wild blueberries on your journey. You’ll return refreshed, closer, and wondering why your trip was so darn short. Yes, I’m already trying to squeeze another trip back before the end of the summer. After all, it’s only a quick two hours flight from Washington, D.C.
Want to recreate Keryn’s family summer trip to Maine? 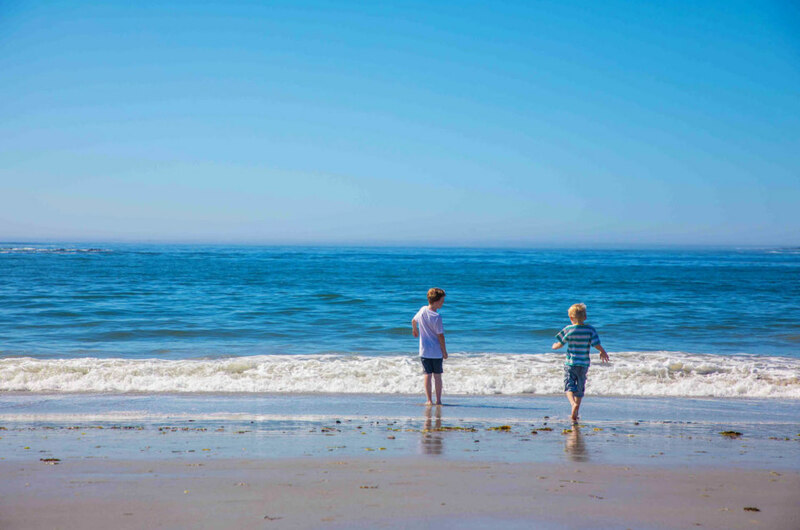 Click here for more information about summers in Maine and check out Keryn’s blog for her full itinerary suggestions — for kids and adults!